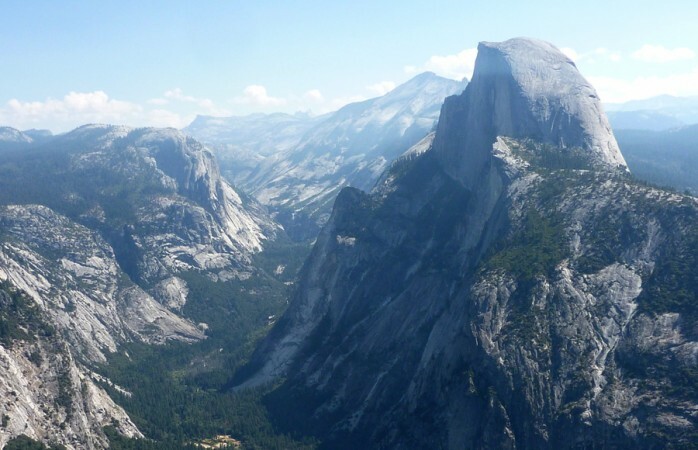 Just four hours east of Berkeley lies beautiful Yosemite National Park. From the valley to the tip of Half Dome, the park is definitely one of the most beautiful spots in California, if not the country. This time of year is particularly lovely with the changing color of leaves and brisk wind to keep you from getting too sweaty as you hike up to Vernal Falls. Whether you’ve visited the park before or not, here are some fun facts to know about Yosemite and its history. 1.The park is open 24/7. Of course, this depends on snowfall and the actual accessibility of the park because of roads full of white fluff, which typically means the park is less ideal to visit between the months of November and April. Also, if you arrive at the park late enough, there probably won’t be any rangers at the entrances, because apparently they sleep too, so you will have to pay the fee when you leave. 2. The canyon used to be a glacier, and there are glaciers in the park. The U-shaped canyon and the pretty granite making up the tall peaks are both evidence of glaciers, which makes the park so special. 3. People free-climb all over the place. Just recently, Alex Honnold free-climbed El Capitan. Not everyone is as brave. Some people choose to rock-climb with back-ups such as carabiners and rope, which means they also carry all of their stuff with them — including a tent that hangs from the cliff and holds all their food and poop. 4. There are more than 40 marked trails to hike. From Glacier Point Road to White Wolf, there are countless hikes to explore. 5. It’s pretty hard to get there. Just getting in and out of the park can prove pretty tricky as you have to take multiple highways and mountain roads. Still, it’s totally worth it, as you can see from all the people who continue to visit. Just remember to clean up after yourself, because not everybody does, and that isn’t good for the beautiful landscape or its wonderful creatures. 6. Trees grow on granite there. If you are a geology nerd, this is actually pretty cool. Basically, moss starts to grow on the granite (which is a straight-up rock, mind you), and that eventually builds up so much that small plants can grow on it, and then one day there is enough soil and plants for trees’ roots to bear down and grab the granite. This is how there are so many trees in Yosemite. 7. If you take your parents or grandparents, you can get a $20 pass for a year instead of $30 for a week. The deal for seniors (above 62) is $20 for a yearlong pass to the park — pretty sweet deal if you ask me. 8. Elevations range from 2,000 ft to 13,000 ft. Remember to slow down a bit, because breathing gets hard when you are that high up. 9. Pets aren’t really allowed. Pets are only allowed in developed areas and paved roads such as bike paths. They’re also allowed in campsites, other than walk-in campsites. There’s the option to house your pet at the Yosemite kennel while you enjoy the park, but that doesn’t sound too fun for your pet, if you ask me. People tend to forget that Buffalo Soldiers were the first park rangers. About 500 Buffalo Soldiers served in Yosemite, evicting poachers and putting out forest fires. It was a difficult job by itself — made more difficult by the country’s climate of racism. There you have it. Whether you are an experienced hiker or want to break in your new, super-cute hiking boots, just remember to chill because that seven-year-old on the trail can do the same hike as you in their little-kid Converse.